Troika marks and artists monograms are present on all Troika pottery pieces. Troika pottery marks are handwritten and Troika artists monograms can vary over time. Particularly when female artists married and changed their surnames, as with Honor Curtis/Perkins. In addition several artists had matching initials, as with Stella Benjamin and Sue Baden. Both the above artists used the initials ‘SB’, and the monogram has to be visually checked to make sure the Troika piece has the correct attribution. 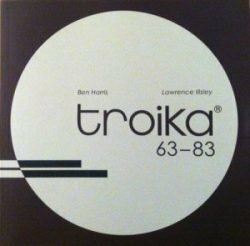 Troika 63-83 is a book published on the 50th anniversary of the founding of the Troika Pottery Company. It details how the mould-cast sculptural pieces developed, the materials used and even tin glazed pieces by Brancusi and Klee. It is definitely recommended reading for the serious Troika pottery collector and can be found in most good bookstores or libraries.